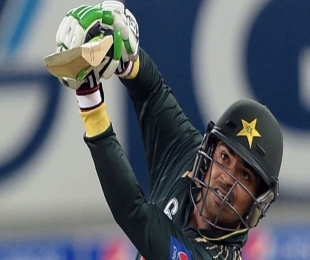 Wellington: Pakistan team management says cricketer Haris Sohail was left "visibly shaken" after a ghostly encounter in a Christchurch hotel room. Sohail fled what he believed was "a supernatural presence" which shook his bed at the Rydges Latimer hotel, taking refuge in the room of a team coach after the encounter earlier this week. Team manager Maveed Akram Cheeva said Tuesday Sohail, 26, phoned a member of the coaching staff to say he had been woken by his bed being shaken. The coach rushed to Sohail's room and found him shaken and feverish. Cheeva said management tried to persuade Sohail the fever may have caused a nightmare, but the player was adamant his experience was supernatural. The hotel's management says it knew of "no active ghost" on the premises. Pakistan media reports said Sohail, an allrounder who has played nine one-dayers and three Twenty20 internationals, was so "traumatized" by the experience he has been unable to train and was forced to miss a one-day warmup match against a New Zealand President's XI. "He's OK and he's concentrating on cricket as he should be," he said. "He had a fever. We think it was the fever that caused it but the player still believes his bed was shaken by something and it was a supernatural something." Sohail joins an elite group of international cricketers who have had ghostly experiences. England fast bowler Stuart Broad switched rooms at London's Langham Hotel in 2014 after a ghostly experience. Broad told the Daily Mail newspaper he had woken in the night and "all of a sudden the taps in the bathroom came on for no reason. I turned the lights on and the taps turned themselves off. Then when I turned the lights off again, the taps came on. It was very weird." Australia all-rounder Shane Watson fled to the room of teammate Brett Lee after becoming spooked in his own room at the Lumley Castle Hotel in England in 2005.